Hello all of Jen’s readers! I am Jane and I blog over at Jane From The Blog. I have been in love with Jen’s blog since early 2010 and I love the way she names every blog post, her lively pictures, and her stories. Last July, right after I graduated from college, I moved to Bali (one of the islands in Indonesia). I’ve previously lived in the capital city for almost 21 years. Sometimes it's ridiculous how many people know Bali but they don’t know Indonesia. Weird, I know. Anyway, I feel so blessed to live here with my family, moving from a big crowded city to a place where you can feel the fresh air, full of beautiful culture and history, and also beaches! Speaking of beaches, there’s so much here in Bali. Last week, one of my friends came here for visit and we also had a little project to talk about. I thought a nice coffee shop wasn't enough for us that day, so we went for walk on the beach instead! Plus, the weather was totally nice! It has been raining almost every day before my friend arrived, so we were really happy. The pictures you see above is Kuta Beach. Kuta beach is also the most visited place when you come to Bali. There's so much entertainment around here such as malls, cafes, shopping spots, live music, restaurant, etc. 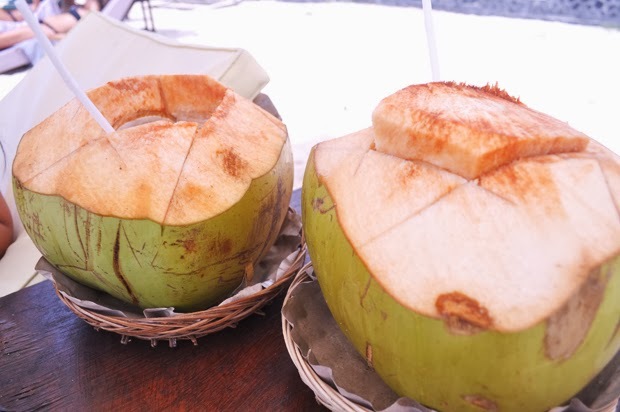 The fresh coconut water is a must! Actually this picture was taken on a different day, but trust me you can almost always find coconut at the beach side. I hope you guys have a wonderful holiday! Warm hugs and lots love from Bali! What a perfectly beautiful beach! It just snowed 3 inches overnight here so I'm just dying thinking about being in shorts and a flowy top..the jealousy is real! This is nice to see with all the snow around in Illinois :) Happy New Year!